My job at WSDOT is to help manage projects and information for Snohomish County. 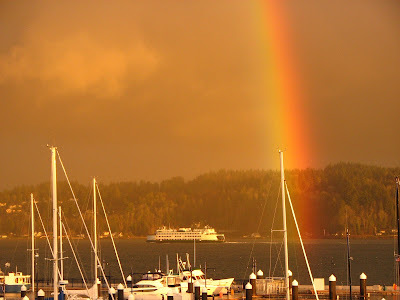 But when Washington State Ferries announced a series of meetings to get public feedback on the long-range plan, I was offered the chance to work with the group who manages our highways on the water. I knew it would be interesting. I knew the ferry community was passionate about their boats. So I agreed to help set and gather public opinion for the 10-meeting series. After listening to hundreds of people, and transcribing the 500 comments submitted during the two weeks of hearings, a few things became very clear to me. Ferries are a lifeline to these communities. These folks want to make the ferry system work better for themselves and for others. They didn’t want someone to just listen to them, they wanted change. There were an overwhelming number of opinions and comments that came in every shape and form. Whether it was a letter, e-mail, handwritten note, DVD, pictures, articles, I took every single piece of information and made sure they were organized in a hard copy and electronic form. The executives requested this information for their meetings while revising the plan and it was important for me to make sure every voice was heard. Marta Coursey, WSF Communications Director, made notes of speakers so she could match comments and inquiries with faces from the night before. Some people believe we held the meetings because it’s a legal requirement. I would have to disagree. While it is a legal requirement, those who run the ferry system are equally passionate about hearing and doing what’s important for these riders. They, too, want to make a system that works for as many people as possible. Case in point: We were coming home (on the ferry) after an intense hearing on Vashon Island. We had an unprecedented turnout of 600 people and we were all exhausted After just barely making the ferry, a coworker and I went upstairs to relax, only to find David Moseley, Assistant Secretary of Washington State Ferries, walking and talking with ferry workers on deck. He joined us as we discussed the draft plans with concerned citizens. In that moment, he proved his personable reputation to be true. He was listening, all the time, listening on this boat. How often does the head executive for the nation’s largest ferry fleet do that? A view of the Bremerton Ferry right before a public hearing. It was a bittersweet departure from ferries when my three-week assignment was up. I learned so much more about the life of a ferry commuter and the crews who work everyday to make the ferry system better for those who ride it. Demolition is awesome: Can I take a whack at it? 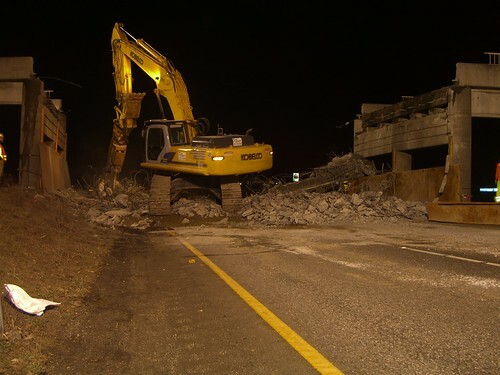 I stood in awe last night in the middle of Interstate 5 in Burlington and watched crews attack and destroy the SR 11/Chuckanut Drive overpass. It was reduced from a functioning road to a pile of rubble in a matter of hours. All that concrete and steel didn’t stand a chance against power of the hydraulic machinery. Crews brought in two excavators outfitted with a hydraulic Hoe ram and hydraulic jaws. The Hoe ram was basically a jackhammer on steroids. The bridge and ground shuddered as it repeatedly battered the overpass. At times, I had to lift the camera and tripod off the ground while taking video and pictures because of all the shaking. The hydraulic jaws looked like a T-rex munching on concrete. The machines ripped through the steel and concrete like they were tearing wrapping paper off a present. There is just something about watching construction equipment tear down stuff that is awesome. It’s too bad that I wasn’t Mike Rowe from the show Dirty Jobs on the Discovery Channel. I’m sure that if he was on-site last night, the crew would have let him ride in the excavators and a take a whack at the bridge. I imagine the demolition was like taking a swing at a stationary piñata with a bat. Who doesn’t love to hit piñatas? I definitely wanted a turn so I could take a swing. The demolition was an impressive display of power and might. From start to finish, the whole process took less than six hours. Crews closed the interstate at 11 p.m. and detoured traffic. Dump trucks poured sand on the interstate beneath the overpass to protect the pavement from falling debris. Within 15 minutes of the closure, crews started in with the Hoe ram. First to come down was the concrete guardrail. Then the roadway was punched out between the concrete girders. 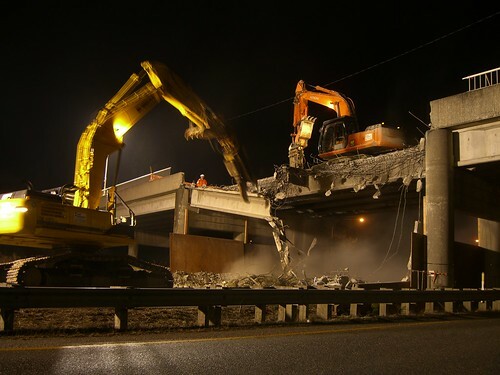 By midnight, crews had moved off the overpass and onto I-5, using the hydraulic jaws to tear into the concrete girders. 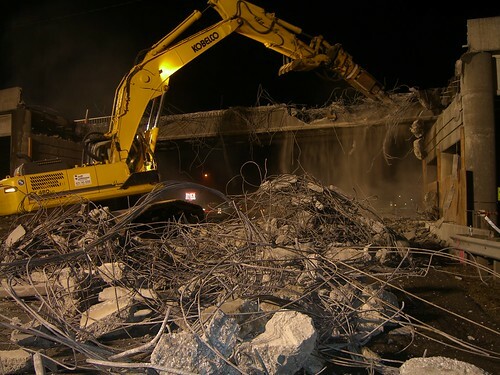 And by 1:30 a.m., all six girders that originally supported the overpass were gone. A gaping hole replaced what used to be a bridge. We were all surprised it came down so quickly. Our goal was to remove the damaged span over I-5 without damaging the rest of the bridge. We accomplished the goal in one night; one night faster than planned, and reopened I-5 on time at 5 a.m. This was the second time in five years that I’ve had the opportunity to stand in the middle of Interstate 5 and watch bridge demolition. Both times I’ve mentally noted how weird it is to stand in the middle of I-5 without having traffic whizzing by – and how cool it must be to operate one of those giant machines knocking down the bridge. Maybe next time we take a bridge down, they’ll let me have a turn. The American Society of Civil Engineers issued a report card today, giving the nation’s infrastructure an overall rating of D. The grading includes infrastructure such as roads, bridges and waterways, and was last issued in 2005, where it earned a marginally better grade of D+. This year, roads themselves got a D- . The report stated that “one-third of America’s major roads are in poor or mediocre condition and 45 percent of major urban highways are congested.” This rating stems from the high operating and repair cost to motorists in order to maintain the current condition of many of our nation’s roadways, as well as the cost associated with traffic congestion and crashes. This seems to be just the latest in reports showing that both the state of our roads and the public attitudes towards traffic safety are in need of increased funding and attention. What more will it take to erase the “culture of complacency” our nation has when it comes to safety on our roads? As the new administration in Washington continues its steps to revive the economy, we can only hope that they keep in mind how important the state of our nation’s infrastructure is to the overall safety and well-being of its people. 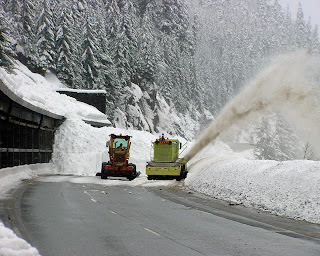 It's that time of year for us here at WSDOT. We start making the shift from winter mode to thinking about the summer construction season. But not all construction happens in the summer. There is an interesting project happening right now in the Tacoma area on SR 16 that will eliminate one of the worst traffic bottlenecks in Pierce County. In early January, work began on a project to replace the westbound portion of the SR 16 Nalley Valley viaduct. If you drive through this area you may not have even noticed it yet because it hasn't affected traffic, yet. All that will change in mid-February when crews begin closing the Sprague Avenue ramps and put eastbound traffic on a new alignment with narrower lanes and shoulders. For those local to the area it will mean using alternate routes or taking a different exit to get home for a couple of years. A major inconvenience, yes - but the improved safety and decreased congestion is a nice payoff at the end. The construction contract was awarded for $120 million. The current viaduct opened in 1971 and was built for about $3.3 million. Each day, about 130,000 vehicles cross the viaduct – about 90,000 more than the daily traffic in 1973. Replacing the westbound portion of the viaduct requires about 200 full-time contract workers who will build 57 columns for 10 new bridges. Crews will drill the columns as deep as 70 feet into the ground. The new viaduct stretches more than 90 feet into the sky, about 30 feet higher than the 1971 viaduct. To build the new westbound viaduct – which includes eight acres of bridge deck – crews will use 10.4 million pounds of steel and pour 48,000 cubic yards of concrete. Workers also will build temporary and permanent storm water retention ponds with the capacity to hold more than 25 million gallons, and a linear storm drainage system more than three miles long. And perhaps the most important number is this: Traffic engineers estimate the completed westbound Nalley Valley project to produce a 60 percent reduction in collisions; That’s 16 fewer collision per year. For more information about this project, visit www.tacomatraffic.com. Unfortunately, there is much less talk about my favorite topic – highway safety! In fact, I have heard almost no public discussion of it. This further underscores for me the current “culture of complacency” whereby motorists, legislatures, and the public at large seem willing to accept 40,000 highway deaths each year as the cost we need to pay to enjoy our mobility. And, it further reaffirms the need for the Foundation’s initiatives that we hope will eventually lead to a new, more positive, traffic safety culture. Most traffic safety professionals believe that as much as 50% of the highway carnage could be eliminated if we had the political courage to enact proven highway safety measures. And, that ultimately achieving those successes will require a system’s approach that strives for safer drivers in safer vehicles on safer roads. The current economic stimulus package represents a golden opportunity to substantially realize “safer roads.” Through years of research, development and evaluations we have “shovel ready” road safety improvements that could quickly be implemented across the country. And, this work would not only create construction jobs but, more importantly, it would save lives. For example, AASHTO recently published “Driving Down Lane-Departure Crashes: A National Priority,” that most convincingly documents that relatively simple engineering improvements, such as pavement edge rumble strips, centerline rumble strips, and cable median barriers, have all been proven to be very effective in preventing serious crashes associated with lane departures, a category of crashes that account for 25,000 deaths each year. For example, since Missouri installed cable median barriers, they have seen a 96 percent reduction in deaths caused by vehicles crossing the median into opposing traffic on two interstate highways. These and similar highway safety improvement efforts should be a vital component of any economic stimulus program! For those of you who follow politics but don't have the time to attend the public hearings here in Olympia, you may be interested to know the latest on transportation issues, particularly after the heavy storms we've had this winter. This week Secretary of Transportation Paula Hammond spoke to the state House and Senate Transportation Committees on the "state of transportation" in Washington and our flood response. One of the points that Paula wanted to convey is how important safe, reliable transportation is to all of us and the economy – no surprise to anyone who's ever had to commute to work during rush hour. But it goes beyond merely getting to work early enough to grab a decent parking space and that second cup of coffee. It's about a transportation system that's the backbone of our economy. It's about a system that allows hardworking people to get to their job, be it at a shopping center, warehouse, farm, business park, or manufacturing plant. And let's not forget – when it comes to quality of life issues, we all want safe, reliable transportation, because it gets us to the grocery store, shopping, schools for our children, and entertainment. "Great," you say, "so what's the problem?" This past winter was the problem. Question: During Christmas Week, did anyone do any grocery shopping? (The answer is "yes," unless you ate your new DVD player.) You may have noticed that some of the store shelves were empty, or at least lacking the usual amount of products you've come to expect. This may have been due to the convergence of two factors: The grocery industry's practice of Just In Time delivery, and the unusually heavy snow we got in December. Grocery stores typically don't keep huge supplies of inventory on hand (perishables, for example), but they can usually count on that item being replenished on a regular basis – except when the delivery trucks are delayed. Then those store shelves begin to get mighty empty very quickly, and you find yourself searching for items which ordinarily wouldn't be that difficult to find. In my case, it was mini-marshmallows. My mother wanted mini-marshmallows for hot chocolate. Not just any kind, mind you, but the mini ones. I braved icy roads and treacherous parking lots at three different stores, and I had to go home and tell the woman who gave me life that I couldn't find her mini-marshmallows. So we wallowed in our self-pity, sipping plain hot chocolate. So that was my first practical demonstration of the value of a reliable transportation system. Don't misunderstand, the system is working, but it's stressed by a growing population, and it needs tender loving care, especially after such a hard winter. Travel safety is improving, which is great, but we can always do more. Then there are the future investments we have to make to our whole system: highways, transit, ferries and non-motorized travel. Finally, we should focus on getting smart about growing demand, wringing the most mileage we can out of past investments, and finding a way to accommodate future commuters in a way that's sensible and sustainable. So there you have it – a very abbreviated version of the presentation that Paula gave to our state Legislature's Transportation committees. As you can see, our state Legislature has some tough decisions to make about the future of our transportation system. January rain storm caused severe flooding across the state. 1 p.m. update: 90 sections of highway reopened. There are 34 sections still closed and 14 restricted. 10 a.m. update: 85 sections of state highway have reopened. There are 39 sections still closed and 12 restricted. Busy morning this morning. As of 4:30 a.m., 68 sections of state highway have reopened. There are 49 sections still closed and 18 restricted. The amount of roads closing is changing constantly, so I would recommend looking at our county-by-county update site to see if a road is open or closed. If you don't see a closure on our travel alerts and slowdowns page that means the road has been opened. There were so many closures it became very difficult to navigate the site yesterday. In terms of reopening the roads, here are some of the timelines we know of right now. 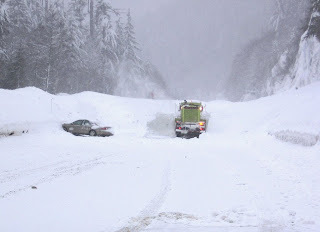 US 12, White pass - This area was probably the hardest hit of any of the passes, and we have no estimate for reopening yet. US 97, Blewett pass - There are multiple washouts on this road, no estimate for reopening yet. One important note to drivers: Even though I-90 will open to traffic, crews are still working out there to get it completely cleaned up. Please give our crews plenty of room if you plan on traveling out there today. I-5, Lewis County (near Chehalis): 12:30 p.m. update: I-5 in both directions now open to all traffic. In a weird string of events yesterday, we tried to route trucks past the closure on SR 7 yesterday but wouldn't you know it, a mudslide blocked the road. At least we tried :). We have some amazing photos of this recent event on our Flickr account. There was an amazing amount of damage across western Washington. Remember the trouble we were having with our AC unit in the server room? We put enough portable AC units and fans to keep the servers cool and the Web site up and running. Turns out that the part we needed to fix the unit was trucked up from California! They are waiting for us to open I-5 to get the part to us, so this closure directly affects us also. We will definitely breath a big sigh of relief when that part gets here and we can finally fix that AC unit. We know how important these routes are for you and are working as hard as we can to get them safe and get them open again. I came in at 4:30 this morning expecting to either head to Chehalis, Fife or I-90 at Snoqualmie Pass. After discussing the possibilities and reviewing trouble spots with my supervisor, we decided that Snoqualmie Pass was the way to go. I grabbed video and digital cameras and was off to adventure the unexpected. When I reached the closure point at North Bend, I talked with the State Trooper on scene and was on my way to view the flooding damage from the recent rains. It was still dark and very hard to see when heading up the mountain. The current conditions called for me to drive well below the speed limit. I chose 35 m.ph. thinking it was the way to go. As I made it closer to Denny Creek, I hit a patch of melted snow, sending water and mud across my windshield handicapping my view. After catching my breath, I pulled over to the side of the road to see what I had hit. I was surprised to see what looked like a river on the shoulder. After spending nearly 30 minutes taking video and pictures I made it to my next stop: Denny Creek. I exited the freeway and captured a buckled road, a river across the road and several items of debris. 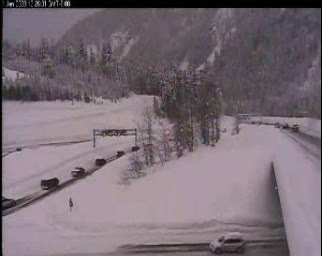 After my adventure through the pass, it’s evident why we have closed I-90 over Snoqualmie. Our crews are doing everything possible to make sure the roadway is safe for drivers before it can be re-opened. For more pictures on my trip through Snoqualmie, visit our flickr account. The next logical step toward an enhanced traffic safety culture is to build support for implementing known regulatory and legislative solutions. Although there are dozens of known solutions that can, and should be implemented, here are a few of my favorites. Take for example graduated driver licensing (GDL): 16 and 17-year-old drivers are five times more likely to die on the road than adults, per mile driven. To combat these odds, every state in the U.S. has adopted some form of GDL; however, not all systems include the components believed to be the most effective. The comprehensive GDL programs that yield the greatest safety benefits include several provisions, such as a minimum age of 16 to obtain a learner’s permit; 30 hours of supervised driving practice; a restriction on driving unsupervised after 10 p.m.; and a restriction of no more than one passenger, among others. Specifically, a 2007 AAA Foundation report found that the programs with five of the seven recommended provisions were shown to reduce deaths and injuries by nearly 40 percent. But, sadly today, only 8 states and Washington, D.C. currently have even 5 of the 7 recommended components. Electronic Stability Control (ESC), one innovative technology solution, is not yet well known to most car buyers or motorists, but it should be. Using high-tech sensors, linked with anti-lock braking systems, ESC can sense when a car is about to go out of control and selectively apply the brakes to prevent loss of control and skidding. Past research in the U.S. and abroad has found that ESC can decrease deaths in single-vehicle crashes by as much as 56 percent. The federal government has recognized the benefits of this technology, but they will not be fully mandated in new vehicles until model year 2012. Why can’t we accelerate the implementation of this known solution? Why don’t consumers demand this feature in new cars? Similarly, edge rumble strips, centerline rumble strips, and cable median barriers are quite effective in preventing vehicles from leaving respective travel lanes, actions that account for 25,000 deaths each year. For example, the state of Missouri has taken a systematic approach that addresses shoulder width, rumble strips, guardrails, and upgraded signage, and has seen a 25 percent reduction in fatalities resulting from lane-departure crashes over the past three years, and has reported a whopping 96 percent reduction in deaths caused by vehicles crossing the median into opposing traffic on two interstate highways where they have installed cable median barriers. Unfortunately, many jurisdictions have been slow to implement similar efforts. Seatbelts save lives if worn and it is extremely encouraging that according to daytime observational surveys, over 80 percent of motorists are buckling up. Nonetheless, the National Highway Traffic Safety Administration (NHTSA), reports that 55 percent of passenger vehicle occupants killed in crashes in 2006 were not wearing them. And once again, there are known solutions we could implement. For example, primary seatbelt enforcement laws — laws that give police the right to stop and ticket someone for not buckling up — have reduced fatalities by nearly 10 percent in states with such laws compared to those that do not. And, enhanced seatbelt reminder systems — systems that beep, buzz, or otherwise annoy a driver into putting on their seatbelt — could play a vital role in getting more folks to buckle up. Some studies report a five to six percentage point increase in buckling up with just the use of belt reminders. That’s a lot of lives saved. In fact, NHTSA estimates that over 5,000 people who died in 2006 could have been saved if everyone had been wearing seatbelts. Perhaps the most common, and illusive, dilemma faced on the road is speeding. We have essentially allowed ignoring the speed limit to become normative behavior. In the Foundation’s Traffic Safety Culture Index, 45 percent of drivers admitted to exceeding the speed limit by 15 mph on the highway in the month before the survey, including a handful that admitted doing so very often, and again, these were only the ones who were willing to admit it. NHTSA cites speeding as a contributing factor in over 30 percent of crash deaths, equating to more than 13,500 deaths in 2006 alone. However, most traffic safety professionals believe these statistics substantially underestimate the true size of the problem. One large and prominent systematic review of published research on speed and speeding concluded that even just a one-percent reduction in traffic speeds on a road would reduce crashes by two percent overall and reduce serious and fatal crashes by three percent. This may not sound impressive, but again, this is for only a one-percent speed reduction — one percent — and the result would be an even greater decrease in road casualties than would be expected to result from an equivalent decrease in traffic volume, according to the study. There are lots of known ways to discourage speeding, but so far their implementation in the U.S. has been limited. For example, studies show that speed cameras are proven to reduce injury crashes by 20 to 25 percent from fixed, conspicuous locations. Yet only six states and Washington, D.C. currently have laws specifically authorizing speed cameras. Moreover, new intersection designs, such as roundabouts, have yielded substantial, positive results in the prevention of crashes. A well-controlled study of the effect of converting several traditional intersections into roundabouts in eight states found that the roundabouts reduced fatal crashes and crashes resulting in serious injuries by 90 percent – 90 percent. Fortunately, more and more municipalities have seen the success stories from Europe where roundabouts are more common, and are starting to construct them around the country. But, there are still many jurisdictions that have not been converted. Some solutions are even more obvious, like helmet laws. The facts are staggering. Motorcycle fatalities have more than doubled since 1996, and over 40 percent of those killed do not wear helmets. NHTSA predicts that 750 motorcyclists who died in 2006 could have been saved if they had simply covered their head. In addition, various studies report that once the laws are enacted, motorcyclists obey, typically at a rate of 83 to 90 percent. Enacting helmet laws in states without them has resulted in increases of use from 50 to 90 percent. The proof is there. Alcohol is arguably the deadliest element that can be coupled with driving. According to NHTSA, in 2006, 13,470 fatalities occurred in crashes involving a driver with a BAC of .08 or higher, and almost 16,000 occurred with the driver’s BAC of .01 or higher. The Traffic Safety Culture Index found that nearly 10 percent of people polled admitted to driving when they believed they were legally drunk, in the past month. Furthermore, eight percent of drivers involved in fatal crashes had prior DWI convictions. Thus, people are knowingly repeating destructive behavior. Alcohol ignition interlocks — devices preventing a vehicle from starting if its driver blows a BAC over the legal limit — are proven to be effective. So effective, in fact, that research has shown that roughly 1,100 lives could be saved if all drivers with any prior DWI conviction in past three years were prevented from driving with any alcohol in their system; and nearly 800 lives could be saved if only drivers with priors could be prevented from driving with BACs over the legal limit of .08. And, the Foundation’s Traffic Safety Culture Index found that four of every five Americans supported or strongly supported requiring all DWI offenders to use interlocks before they could start their vehicles. So why don’t we require them? Furthermore, studies on physicians screening for alcohol abuse have shown general reductions in both drinking and alcohol-related crashes and injuries. In fact, over time, alcohol intervention groups have proven to decrease hospitalized injuries by nearly 50 percent. It is estimated that 30 to 50 percent of the 2 million patients entering trauma centers in the U.S. have alcohol problems, yet screenings are not mandatory. Patients entering an emergency room or trauma center have their blood pressure checked — why not an alcohol screening as well? And those are just a handful of the many known countermeasures that are proven to work. One death is too many, and allowing over 40,000 a year, or one every thirteen minutes is an outrage. The roadway death toll equates to 9/11 occurring monthly for over a year, yet no change is seen. And, despite the fact that the numerous solutions exist, many remain unimplemented. How many more crosses and flowers will be raised before a change is finally made? Crews are dealing with a statewide winter storm that has caused more than 60 road closures since early Wednesday. I-5 remains closed from exit 68 (11 miles south of Chehalis) to exit 88 (about 20 miles south of Olympia) for due to flooding. All three main east-west mountain passes remain closed at this hour due to water over the roadway and avalanche danger. The Chehalis river still hasn't crested yet. We have about 3 feet of water on the northbound lanes and 2 feet of water on the southbound lanes of I-5. There is a great Web site offered by the National Weather service showing the current Chehalis river level. There is a worse case scenario today of I-5 being under 10 feet of water. We are still getting reports of roads closing throughout the state, check our travel alerts to get the latest update. Do not attempt to cross a flooded roadway in your vehicle (especially if already blocked off). There is no way to know how deep the water actually is until it is too late and even a small amount of water can cause your car/truck to stall. Do not attempt to cross a flooded roadway by foot, water may not look fast from the surface but it can easily sweep someone from their feet. Try to avoid floodwaters. Floodwater can be contaminated with raw sewage, gasoline, and other contaminants hazardous to your health. If in a flood prone area (frequent flooding) and roadway is adjacent to river, use extreme caution. Floodwaters can erode the roadway and if driving during limited visibility driver may not see missing section of road until it is too late. I-5 was closed this evening at 6:00 p.m. We originally planned on closing it around midnight tonight, however, because of the amount of water over the highway it was closed earlier than anticipated. We will have crews standing in the rain all night monitoring the rising waters. At the moment there are no north-south routes available between Seattle and Portland. 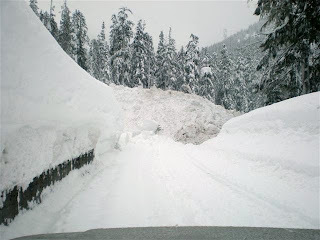 All three major east-west mountain pass highways through the Cascade Mountains remain closed due to extreme avalanche danger and mudslides. These passes are not expected to open until crews have safe access to the highways and can assess the avalanche danger and inspect the roadways. The priority for tomorrow will be opening I-90. Word is that the rain will be lighter tomorrow, however, rivers will continue to rise. Originally uploaded by Washington State Dept of Transportation. An amazing amount of rain is falling on Washington today. At one point we have counted over 60 road closures due to water over the roadway. Pictures are rolling in of the incredible damage that has been caused due to melting snow and rainfall. 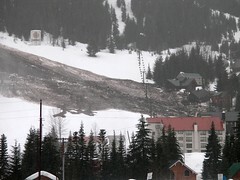 This photo is of the Summit East ski area of Snoqualmie pass. Check our Flickr account throughout today and tomorrow for more pics of the terrible damage all this water is causing. We have received a lot of curious emails lately asking us why we close the mountain passes when there is risk of avalanche danger. I could tell you, but I thinks that these photos will tell the story better. When you see what an avalanche looks like and consider the danger of being buried by one, you can see why we take the closing of the passes very seriously. 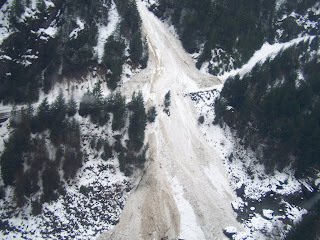 Did you know that there are at least 40 avalanche chutes on Snoqualmie pass alone! 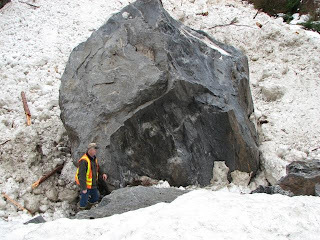 SR 20 - January 2008 - Newhalem - Not just snow comes down in an avalanche, sometimes rocks do too. Typical Avalanche at Snoqualmie Pass East snowshed - an avalanche of this size can cause the pass to be closed for two hours. As you can see there is considerable risk to any vehicle that tries to cross the mountains when these dangerous conditions exist. We appreciate your patience while we take the appropriate time to make sure the highway is safe for travel. 9:30 a.m. update: The AC unit has been fixed. The Web site is running normally again. We are all breathing a heavy sigh of relief... now if we could just get those avalanche chutes cleared on Snoqualmie pass. Some time early this morning we had an AC unit go out in the Web server room. Once servers get to a certain temperature they shut themselves down, before they get too hot and cause damage to internal components. Because of this, we are running at limited capacity this morning and you may see intermittent outages of the site as servers shut down for safety. We have almost every fan in the building in there right now, but if you have ever been in a server room, it has to be kept very cold. We will keep you up to date for travel alerts here while this is happening. Interstate 90, Snoqualmie Pass - check out our travel alerts and slowdowns page for the latest updates. Our wish for 2009 goes like this, "Winter, winter ... go away!" Seriously, we just started winter in Washington and we're already ready for it to be over. The main mountain passes for east-west travel ... the backbone of our state's economy ... are closed today. It looks like Stevens (US 2) and Snoqualmie (I-90) will be closed through the night into tomorrow morning. Eastern Washington is going to get more snow tonight and into tomorrow, too. We'll have our crews deployed, all available resources are at hand. But even with our best efforts, you should continue to expect winter driving conditions throughout most of Washington. Here's a shot of crews leading a caravan of folks back off the mountain.